Since I first wrote about Cromford Leather nine months ago, I’ve been using them consistently for leather alterations. I thought it was worth a catch-up piece, therefore. It's also a nice opportunity to show their workshop in the basement, including some of the vintage pieces they’re repairing for customers. 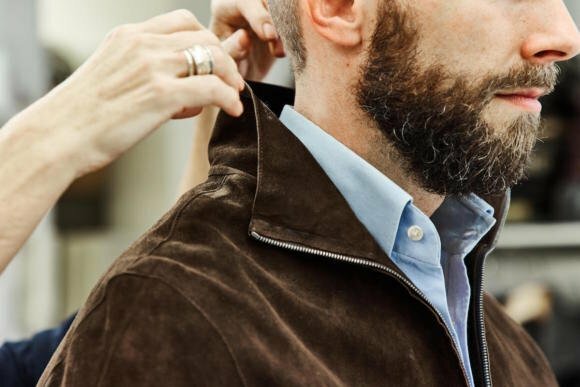 If you care about how clothes fit, leather and suede outerwear can be a pain. There aren’t many variations in sizing, so if you don’t fall into the standard S-XL grading, you’ll end up with something that doesn’t fit in one way or another. Being tall and slim, I often find myself choosing between something that fits my shoulders but is too big in the waist (usually a Medium) or that fits the waist but is too tight in the shoulder (usually Small). Now that I know and like Cromford Leather (Chiltern Street, Marylebone), I buy the right size for my shoulders and have the waist altered. In both cases, the alterations with Pauline at Cromford have worked well. However, be aware that unlike a wool jacket, there are some limitations on what can be changed. It’s worth speaking to Pauline (above) at length to understand what these are. Also bear in mind that altering leather is laborious and therefore expensive (my alterations ranged between £120 and £300). The few issues I've seen with customers of Cromford have been because they don't take the time to appreciate both these points. You can see the complexity involved in leather alterations and repairs in some of the vintage pieces going through the workshop at the moment. 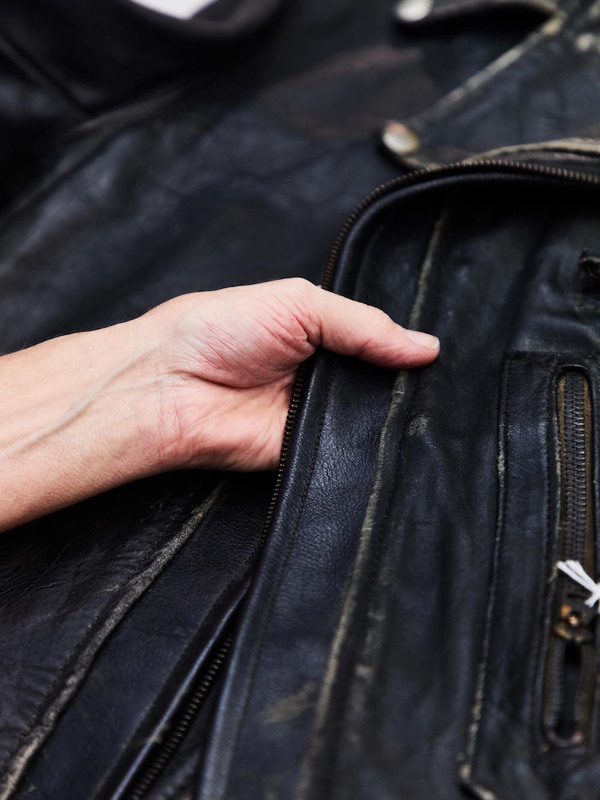 Above, for example, is an old Buco horsehide jacket that is having its zips and pockets repaired. Replacing zips and pocket bags, without changing the look of what is beautifully aged leather, is a delicate process. Harder, though, is working with sheepskin jackets, like the one below. 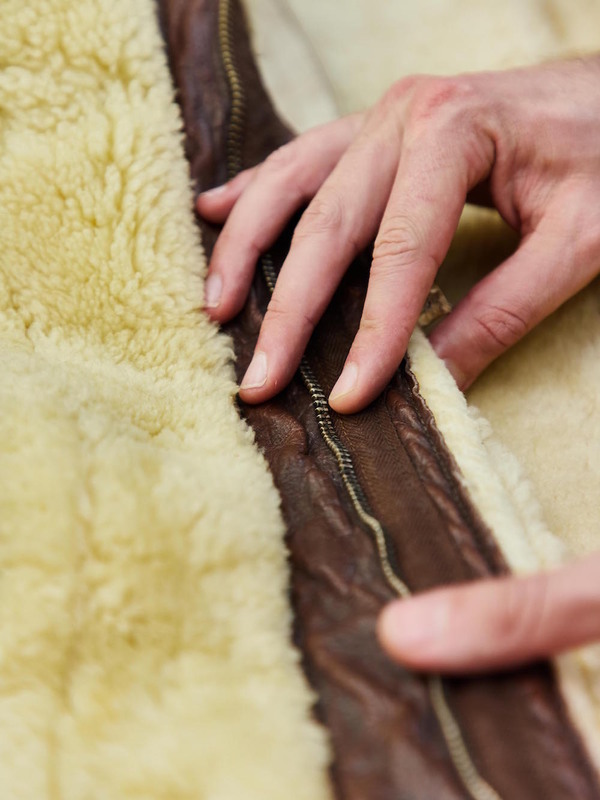 Shearling dries out as it ages and vintage pieces will rip easily. Sewing into something that fragile is hard - you often rip the very thing you are trying to secure. My latest alteration project was the suede zip-up blouson you can see below. This is an old jacket from Carlo Brandelli’s first stint at Kilgour. As with all his things, it was simply and beautifully done: lovely thin suede, unlined, with a covered zip in front and nothing on the cuffs. The only thing I never liked about it was the collar. I’ve always been partial to a collar that pops: that stays up when it’s put up. It’s probably related to having a relatively long neck. This collar stayed up at the back but collapsed at the sides. Which had its own appeal, but I disliked. Pauline put some fusing on the inside of the collar, covered it with a matching piece of suede, and finished it all invisibly. The collar now stays up perfectly. 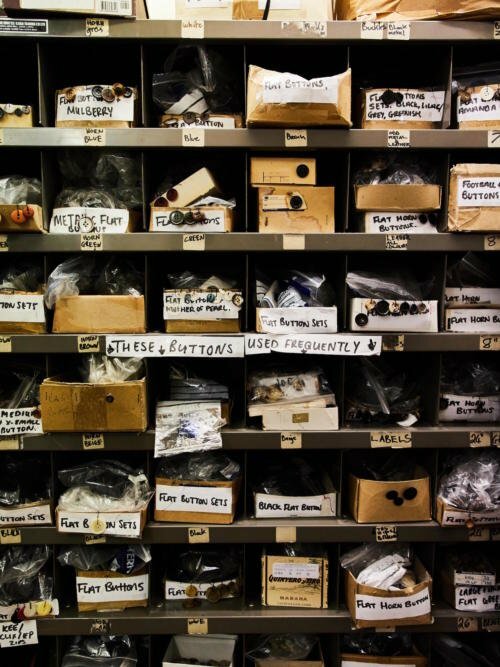 It's the quality of work like this, as well as the rarity of leather-alterations specialists in London, that has me continuously recommending Cromford. 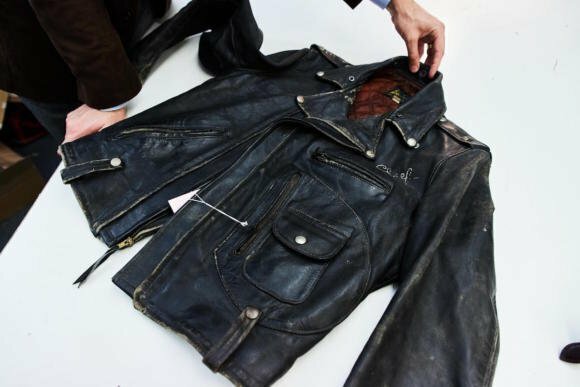 You can follow the discussion on Cromford Leather: Update, workshop, and vintage jackets by entering your email address in the box below. You will then receive an email every time a new comment is added. These will also contain a link to a page where you can stop the alerts, and remove all of your related data from the site. Will they work on bags etc? Interesting. A good tip. I love suede and will be paying them a visit next chance I get. BTW, how about a post on exotic materials like vicuna, camel, or muskox? Any views? I’m attracted to the unusual, but would like to know more about how they perform, wear, etc. Hmm, yes perhaps. That sounds more like you’re interested in wool than leather? To be honest, yes. The Melina looks great on you, but I can never rid myself of thoughts of the Fonz when it comes to leather jackets. I’m fascinated by Vicuna, though. I picked up a scarf from Johnstones of Elgin, the last they had in stock, at the tail end of the winter sale for 200 pounds. Their new version is going for 2000 or something. The staff handled it like it was the shroud of Turin. I put it on and went for a walk round St. Andrews and within 10 minutes was divebombed by a seagull. Miraculously they missed the scarf but made a right mess of my Gieves and Hawkes coat. Evil things seagulls. Simon do you know of anyone who repairs leather gloves? I have a pair where some of the stitching on the fingers has come loose. The gloves were expensive enough that it is worth trying to repair them rather than buy another pair. 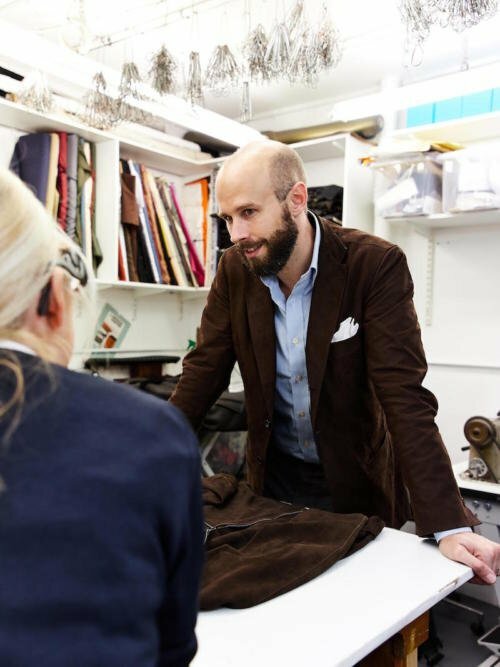 @Peter – You might try emailing: https://www.chesterjefferies.co.uk/ I know they do linings repairs so they might take care of stitching as well. Can one do anything to prevent (or forestall) shearling coats from drying out? Is there a “leather dressing” you can put on the exterior (like with old leather books) – or is the problem that the soft underside (the interior) is the thing that dries out? Is storage – the way it’s stored, or where it’s stored, or the climate – a key part? And what’s the lifetime of a shearling coat? I just picked up a full length Gimos, and I’d like to keep it in good shape for as long as possible. Cold storage in the summer? A/C? Should I also waterproof it – or spray it with something water resistant, or is that a natural feature of shearling? Thanks, as always, for your advice. It will be a question of decades rather than years, so you should be fine Wes. But I’m checking with Pauline on her advice too. Excellent article! Very clearly written and superb photographs! Just to endorse this service, my son recently had the sleeves on a Rick Owens “Stooges” jacket shortened by several inches. The “look” is for the sleeves to be long, but he just found it irritating. The sleeves had zips in them to further complicate matters. Any recommendation for cleaning and repairing a (machine stitched) tan bridle leather briefcase that has had coke spilled over ones side and loose stitching in on of its corners? God. No, and hard to tell remotely, but do try taking it to a high-end maker that might be able to give you some practical advice. I find myself sorely tempted by one of Cromford’s leather coats (the MTM double-breasted three-quarter-length number), but I can’t for the life of me imagine what I would wear it with! To buy or not to buy, that is the question…I wouldn’t shell out a couple of grand for an item which hangs unloved in the wardrobe for want of anything appropriate to pair it with. Thoughts?